Makeup and Modifieds: September Goals. It's like that empty tea mug right before you pour your boiling water in it. You visualize how beautiful that cup is going to be here in a few minutes, full of your favorite tea and how it makes you feel warm and fuzzy when you take that first sip; how content and relaxed you're about to feel as your cold hands are wrapped around that hot mug. Ahhh, I love knowing what that empty mug is about to bring. Don't you? In calendar terms, January marks the beginning of the new year; the time when we all look forward to making new year resolutions and reinventing ourselves. It's a time of reflection, on the past year and on ourselves. But for me, I start this process of reinventing and reflection in October. October has always been a life-changing month for me. And so when September rolls around each year I get excited with anticipation, you know, it's like looking at that empty mug and waiting for the hot water to be poured, that sort of thing. 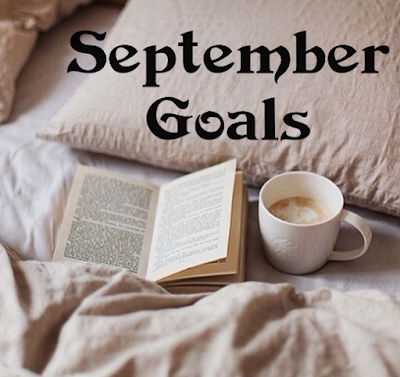 And for this, I have come up with my September Goals. [ 1 ] Keep Blogging, Consistant. I have set this goal many times before but ever since I have dedicated my life to "Living Simply" I have reorganized my priorities and made a planner for me to write everything down in. I've started keeping myself accountable and reminding myself on a daily of the things I need to get done. I am really hoping to continue to write consistently throughout this month and I think what is going to help me stay focused and on time is the fact that I have already written on my calendar the topics for each day in the month of September. [ 2 ] Keep working towards a Healthy Life. I have begun my clean eating and exercising journey once again, because it's been needed, and I'm hoping to continue to work towards a more healthy lifestyle. I haven't gone a full month of health in several years and I'm ready to feel 100% healthy and comfortable again. I know that if I stay consistent and find a routine that works for me, by the time 2016 comes around I will have a new lifestyle routine that I can carry into the New Year. [ 3 ] Remain dedicated to my Daily Devotional's and Time with the Lord. This is the most important on my Goal list. A few days ago, My Speedracer, bought me a new Bible. I've been wanting one for a while but kept pushing it off because I felt content with the 2 that I already had. But I am so glad I finally went and picked up a new one, it's been 10 years since I've had a Bible full of fresh pages. I have started every day with a devotional and ended every day with a few minutes of reflection on how i applied my devotional to my day. It's been such a blessing getting back into the Word of God, because I feel like I've been super distant. It's nice to know that with God, he is that friend that you may not see for a while but when you see each other again it's like you pick back up where you left off. And I have to say, it's an amazing feeling. [ 4 ] No Soda. A few years ago I dropped Soda from my diet, it was difficult but once I was able to do it I felt 150% better than I had when I would drink soda. I'm a huge Rootbeer, Sprite, and Dr. Pepper person so you can definitely say that it's been a bumpy ride. About 8-9 months back I picked up my first soda in over a year and a half. It was a Coke. and it tasted like syrup. I hated it. So I picked up a sprite, then a root beer, then a dr. pepper. and soon I was back on Soda and it's been my "Go-To" again. I was so upset with myself because I had finally become one of those people who drink water all day long, which I preferred. And so, now I am back to trying to rid myself of Soda. I haven't picked up a Dr. Pepper in a week. and I feel happy. and more energetic and less full with sugar/carbonation. [ 5 ] Downsize and Organize. Our house is a trainwreck. This is what happens when you are getting ready to move. We currently live in Speedracer's families house (his grandparents house) and so there is 20+ years of items in this house that range over a handful of family members. So you can only imagine how crazy it is over here right now. I've been itching to move for a few years now and we've finally gotten the opportunity and so I'm in full "Let's get out of here" mode. I love this house, we've built some good memories over the last 5 years, but I am ready to have my own space, with my husband. I'm ready to have a house filled with OUR stuff and OUR memories. But, to do that, we have to downsize and organize our priorities. 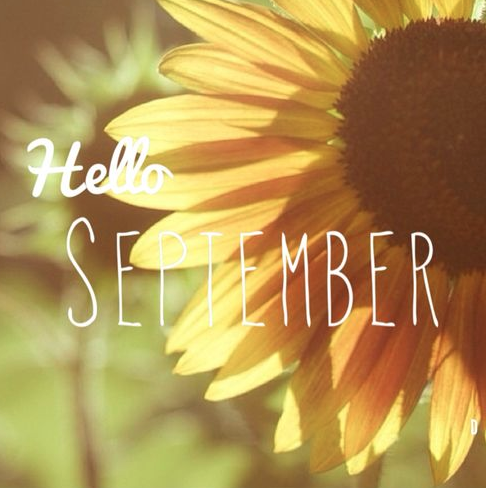 The month of September is going to be just that. I need to downsize our clothes because that's literally 80% of our bedroom and there is no way it's all going to fit at the new house. [ 6 ] Pack up the House more. Speedracer and I got married in April 2014, and out of all the bridal shower and wedding gifts we received, we have used 2 items. TWO! Because we boxed the rest up and placed them up in the garage rafters until we can get our own house. We wanted to be able to use our own stuff, brand new, it on our house. So I haven't seen anything for over a year now. and I'm going crazy. BUT, we still have SO much to pack up, but i've been avoiding because a majority of what is left out is things we use on a daily basis. And I don't want to pack it up if we aren't moving for another month or two, or three. (the actual moving date is sadly a mystery but in the 2-5 month range). But our house is still in boxes. a war zone of packing up a 4 bedroom house, 2 living rooms, a dining room, kitchen, and garage. Although my list seems short, I can definitely tell that it's going to be a long September. There is so much to do within this month and the faster we pack up and get things in order, the faster and easier this move can be. (at least this is my hope). I am just going spend September focusing on the things listed above and enjoy this month. I love September. It marks the month that my Speedracer and I officially exchanged words. This month will mark 5 years. but that's for another post....I hope you all enjoy the beauty of "the empty tea mug." And don't worry, the mug will be full here soon...I promise.